Nowadays, there are lots of ways for people to capture memories by taking photographs or filming a home movie. Besides the wide variety of digital cameras, there are numerous mobile devices that can take high-resolution photographs: laptops, tablets, smartphones, and more. But viewing those photographs and cataloging them might not be so convenient. People want alternatives to having to transfer pictures to a computer or seeing them on the small display of a smartphone. 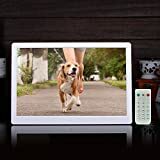 That’s where digital picture frame come in: They come in a variety of sizes and resolutions, and they’re much more user-friendly and portable than even a laptop or tablet. You’ll see digital picture frames that are entirely WiFi: they get their pictures over a Cloud that is maintained by the digital picture frame company. Then there are models that need a USB flash drive or memory card to get the photos into the picture frame. There are also devices that combine both functions: managing pictures over a Cloud, as well as ports for memory devices. We can distinguish between digital picture frames by the means by which you put photo content into the frame. 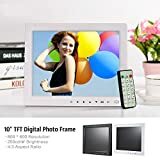 Combination devices: These are digital picture frames that can receive photos both by means of a memory card or USB device, as well as by means of WiFi. 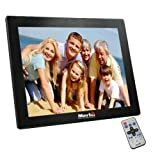 The Nixplay 12" WiFi Cloud Digital Photo Frame can receive pictures and video by both methods: WiFi and removable media. Log into the Nixplay website. Create a new album for the pictures that you're taking. Add photos into the album by means of an app, or drag-and-drop. The pictures get uploaded to the Nixplay cloud server. You can create a playlist that you assign a particular name, and then categorize the pictures that go into that playlist. That way, you can see slideshows that are organized by subject. You can also arrange pictures by date, or alphabetically. 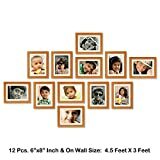 Great for getting pictures to relatives: Since you can transfer pictures to a digital picture frame via WiFi, you can send pictures to loved ones as soon as you take them. Also, a digital picture frame has an easy interface with intuitive commands. It is much easier to manage than a computer or even a Smartphone. So even an older relative who isn’t so tech savvy can manage to flip through an entire photo album and get the pictures in real time. Intuitive Interface: It’s important that the device is easy to use--especially if the digital picture frame is for relatives that aren’t so adept with new technology. Besides pressing the buttons on the side of the device, most digital frames are supplied with a remote control with intuitive commands. You can find digital frames that have interfaces in different languages (such as the Koolertron Digital frame), which is another big plus. Wall mountable: Some digital frames have a number of viewing options. You can stand the digital frame on the table, or hang it on the wall. Motion sensor: A number of digital picture frames have an infra-red motion sensor: When the sensor detects that someone is in the room, the digital frame will continue displaying pictures in slideshow format. But, if it doesn’t detect any motion for an extended period of time, the device will turn itself off, to preserve the battery and screen life. Adjusting the display: Picture frames will have means of varying the contrast of the display, as well as the speed at which the digital picture frame proceeds to display the pictures. Picture formats supported: Digital frames may not be able to display all types of formats of pictures. If that’s the case, you might need software that can convert the pictures from one format to another, and only them upload the pictures to your digital frame. The Nix Advance 15” and 18” can display JPEG and JPG photos, as well as MPEG-4, MP4 and AVI movies--but their smaller versions don’t support AVI or MP4. Resolution of the display: You’ll see digital frames with a “4K display” or “Ultra HD”--this means a horizontal resolution of 4096 pixels. (In practice, the resolution is really 3,840 pixels horizontally x 2,160 pixels vertically, which equals over 8 Megapixels in the display. You'll also find digital picture frames with resolutions listed as “1080p”, or "Full HD". The number "1080" indicates the vertical resolution of the screen, while the horizontal resolution will typically be 1920 pixels. That yields a total of 2 Megapixels. You’ll also see the term “IPS”, as in the Nixplay Seed’s 1024 x 768 IPS Display. "IPS" stands for "In-Plane Switching"--this is an LCD panel that employs a technology which provides a wider viewing angle and better color quality and reproduction. Some digital frames will have a resolution of 720p for their video playback. Aspect ratio: This is the ratio of the horizontal to the vertical size of the display, or the ratio of width to height. You’ll see digital frames with aspect ratios of 4:3 or 16:9. There are digital picture frames, such as the Sony DPF-D810 8" LCD Digital Photo Frame, that have an “auto-flip” feature--they flip the display from portrait to landscape when you lay the digital picture frame on its side. Some digital frames, such as the Kodak Easyshare, also resize the photos automatically, to fit the frame. Capacity and number of pictures: Besides using Cloud storage of the digital frame manufacturer, many digital frames have a large internal memory, that can literally hold thousands of pictures. The Pix-Star 10.4" WiFi Cloud Digital Photo Frame has 4 GB memory, which is enough to hold up to 20,000 pictures. But some Nix frames have 16 GB of internal memory. 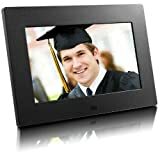 Connection to social media: You can hook up your digital picture frame to your Facebook, Instagram, Flickr or another online digital photo account, and upload pictures instantly. 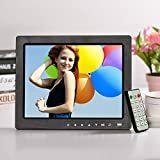 Plays music and videos as well: People take both still photos and videos, so it’s worthwhile to get a digital picture frame that can play videos as well as view still shots. 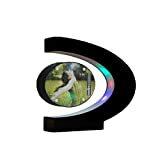 Some also play music, such as the PanDigital PAN8004W01C 8-Inch LCD Digital Picture Frame. Also, the NIX Advance has stereo speakers, to get the most out of home movies. But it also has a headphone jack--that’s important so that you can listen to video and music without disturbing the people around you. Various borders for the frame: Some digital picture frames also have a selection of borders around the LCD screen. One digital frame can have 4 different color borders, that you can switch from time to time, or modify to match the room’s décor. 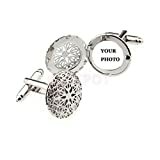 This way, they can look as elegant as traditional picture frames. Additional features: There are also some unexpected surprise features to digital frames. 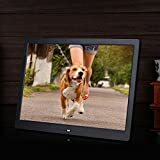 For example, the Pix-Star 10.4" WiFi Cloud Digital Photo Frame also can tell you the time and weather for your area, as well as provide you access to local radio stations. Battery powered vs. corded versions: Some picture frames, such as the Sony DPF-D820 8" LCD Digital Photo Frame, work only on a power cord--that might not be so good if you prefer something more portable. The Nix Iris digital frames use rechargeable batteries, that you can charge up with a USB cable--that gives you more mobility. Nixplay— is a leading digital frame manufacturer. Their parent company is Creedon Technologies, which was founded in 2007, and has their headquarters in Plymouth, England. Creedon includes both Nix Digital (non-WiFi Digital Frames) and Nixplay picture frames which utilize Cloud storage, and/or uploading pictures via a USB stick or memory card. Pix-Star—was founded in 1996 as a software, telecom, and web design company. 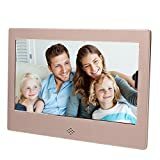 They have developed the Pix-Star Wi-Fi-connected e-mail picture frame. Their digital picture frames are designed for easy navigation and can handle a variety of multimedia files. Their digital frames also access pictures from Facebook, Instagram, Flickr, and more. Their frame allows you to also access music, radio, games, and even weather updates. Aluratek— was founded in 2006, and has its headquarters in Irvine, California. Their first products were digital photo frames so that people would have an alternative to the computer for viewing their photographs. They also make products for Bluetooth audio, mobile phone charging plates, and accessories for Smartphones and tablets. Sony--is a conglomerate with its headquarters in Tokyo, Japan, founded by Masaru Ibuka and Akio Morita in 1946. They deal with electronics, motion pictures and entertainment, music, and finance. They have products for audio and video recording, optical and magnetic storage, computing, photography, and more.